A new chapter from the “Future of Creativity” series will launch on 7th of December. This edition is about “Kindful Brands” and their social imprint. Love and Lobby in partnership with Media Image Factory are the organizers of the event, which is also empowered by Seneca AntiCafe, The Alternative School and Cannes Lions Romania. “Kindful Brands” is focusing on an intensely disputed topic: “the economic value of social initiatives” and aims to demystify the clichés that position CSR as an exclusive PR tool or those that put the equal sign between social and zero return on investment. 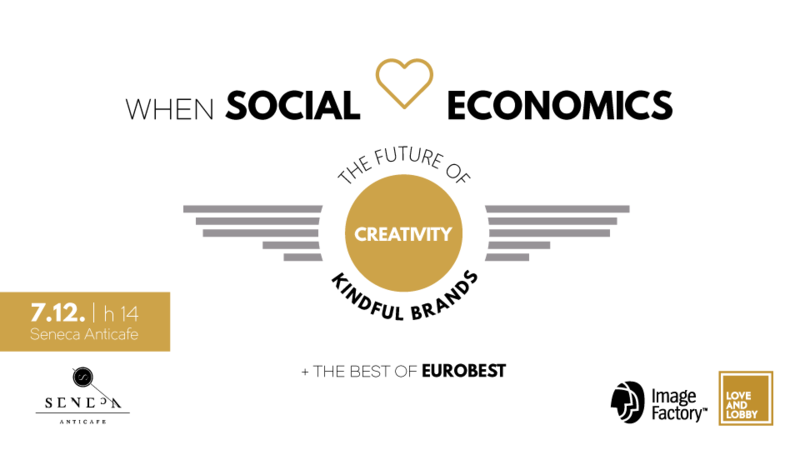 “Kindful Brands” aims to bring a documented and contemporary perspective on “Goodvertising”, with lucid proofs that social and economics can work wonderfully together, through examples from the most relevant international festivals of creativity. The event will clarify the role that social consciousness plays not only in the communication industry or in brand building, but also in the construction of the contemporary business model. Another relevant topic is on how brands are communicating nowadays with their audiences. Tahaab Rais, one of the most award-winning strategists in the Middle East, with constant performances at Dubai Lynx and Effie is the special guest of the event. An entire section is dedicated to Romanian good practice examples, in the panel chaired by Nicoleta Talpeş, the founder of Media Image Factory. This section of the event will make an introduction into the world of local brands that have a sense of responsibility in business, with box office record projects that had an impact at the society level, by finding solutions and solving them. The event will feature global trends in social creativity, illustrated by Cannes Lions, Eurobest and Dubai Lynx festivals, in the presentations held by Tahaab Rais, Teodora Migdalovici, Above 106, Alina Damaschin – the Romanian juror at PR Lions 2017 and Andreea Ghenoiu, the juror of Promo & Activation – Eurobest 2017. Tahaab is Regional Head of Strategic Planning and Truth Central Director, FP7/MENA. He is the most awarded strategist in the MENA Region and was recently also recognized and globally ranked Number 1 among Top Planning Directors in The Directory Big Won Rankings for 2015. Teodora Migdalovici is the Lions Festivals ambassador in Romania since 2004. She has promoted over 30 Romanian talents in various juries, founded the most awarded creative thinking school in Eastern Europe and was the catalyst for the launch of PR Lions as an independent category in Cannes, where she also facilitated the presence of the first Romanian in a jury of such magnitude, before the industry won the first gold. Since 1998 she has been an ambassador for creativity, under the influence of the Love & Lobby principle. For the last 10 years, Nicoleta Talpeş has been leading Media Image Factory, the only communication agency in Romania specialised in social development. Their projects (both client’s and owned) provided expertise in the fields of education (companies and schools, nationwide), culture (theatre and film) or ecology and green technology. Her favorite initiative is CharityGift.ro, the first online charity online store in Romania, developed alongside one hundred volunteers, both local and foreigners. With 19 years of experience in communication, Alina Damaschin worked initially in advertising, in agencies like D’Arcy, Saatchi & Saatchi and Lowe, where she coordinated tens of integrated communication projects for national and international brands. Afterwards, she switched to PR, first as Managing Director, then as partener at Rogalski Damaschin Public Relations, the only Romanian PR agency to own a Gold in Cannes. She represented Romania in this year’s Cannes PR Jury. Andreea has a 12 years career in advertising and she is Jazz’s Group Creative Director for the last 3. She worked for both local and international clients such as Avon, Groupe Societe Generale, Provident, Muller, Medlife, PepsiCo. During the last three years, Jazz became one of the most awarded independent agencies from Romania and won the first Gold Lion for a Romanian independent agency in Cannes last year. Andreea came up with the gold winning idea – “A Voice for Songbirds” – the first campaign to change a law with 0 budget in Romania. This year she will represent Romania at Eurobest, as member of the the Promo & Activation Jury. Tahaab Rais, FP7 MENA – How social can make profit through creativity?